Restoration of cheatgrass (Bromus tectorum) invaded rangelands is among the largest management challenges in the Intermountain West. In an effort to reduce the conversion of native sagebrush steppe into annual communities, the Bureau of Land Management reseeds rangelands after fire at very large scales, seeding tens of thousands of acres per year in extreme fire years. These seeding efforts have mixed success. One factor that may affect the establishment of seeded species in invaded areas is the choice of seeds used in restoration. 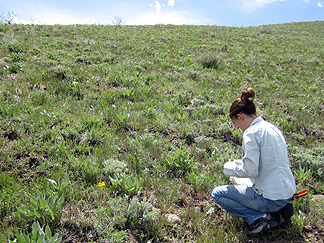 We have demonstrated that plants vary in their ability to tolerate competition with cheatgrass, with traits such as seedling root to shoot ratio and the production of fine and coarse roots affecting the survival and performance of native grasses such as squirreltail (Elymus elymoides), big squirreltail (E. multisetus), and sandberg bluegrass (Poa secunda). This research is comparing the relative performance of native grasses, collected from field sites close to the area to be restored, with commercially-available seeds. Two types of native seeds will be grown in these experiments: a randomly selected pool of native plants, and a pool of plants that possess traits we have found to be particularly beneficial for surviving in invaded areas. Seeds will be planted in 5 field sites in four states, and survival and growth will be monitored for three growing seasons. Additionally, seeds will be collected from surviving plants and compared with the original seeding mix to further determine which traits increase survival in invaded systems. share seeds with collaborators who may be interested in releasing these plants for use in the Great Basin. Benefits to rangelands will be the potential for improvement of restoration of the most invaded of our Great Basin plant communities. Cheatgrass (Bromus tectorum) invasion in the Great Basin is arguably the largest ongoing invasion in North America, converting large areas of naturally shrub, forb, and grass communities of the sagebrush steppe into annual communities dominated by cheatgrass and other disturbance-oriented species (Bradley and Mustard 2006). The invasion of cheatgrass increases fire return intervals in the Great Basin, which limits the ability of native species to resprout or recruit naturally into fire sites (Whisenant 1990, Link et al. 2006). In an effort to slow the conversion of native steppe into annual communities, the Bureau of Land Management reseeds rangelands after fire at a very large scales, seeding million of acres in extreme fire years (BLM statistics). These efforts have mixed success, with the best fire recovery seen at sites where native resprout from the seedbank or from root crowns (Kulpa 2010, James 2011). Multiple issues affect the recovery of seeded fires after burns. Factors such as yearly weather, seeding methods, and timing of seeding are certainly responsibly for observed successes and failures. Additionally, we suspect that the identity of seeds used in restoration affects the successful establishment of seeds in rangeland seedings in highly disturbed areas in general, and in Nevada rangelands specifically. Ongoing work in Dr. Leger's lab suggests that seeds used in restorations do not represent optimal traits for growth in highly invaded systems of the Great Basin. Additionally, seeds currently available for use in the Great Basin are collected from areas on the northern or eastern areas of the floristic provence, with only one available cultivar released from a collection in Nevada (Jones and Larson 2005). Many studies have illustrated the potential for plants to adapt to local conditions, and these adaptations have been observed to affect plant establishment in the wild (Clausen et al. 1940, Fenster and Galloway 2000, Joshi et al. 2001, Leimu and Fisher 2008). Thus, the lack of collections from Nevada, combined with competition from cheatgrass, may strongly affect the establishment of restoration seeding in Nevada in particular, and in invaded areas of the Great Basin in general. By selecting seed sources from areas that match local abiotic and biotic conditions, and selecting specific plants that possess traits that make them perform well in cheatgrass-invaded systems, it may be possible to improve rangeland restoration in highly invaded areas. These seeds are not available to land managers at this time, and this project will provide evidence required for introducing adapted seeds into restoration seed production. Improving the success rate of post-fire seedings would benefit landowners, ranchers who graze public lands, state and federal agencies who use resources to restore invaded systems, wildlife, and native plant communities in the Intermountain West. To compare how well plants with a suite of desirable traits establish relative to plants from commercial sources. Aarssen, L.W., B.S. Schamp, and J. Pither. 2006. Why are there so many small plants? Implications for species coexistence. Journal of Ecology 94: 569-580. Aerts, R., and F. S. Chapin. 2000. The mineral nutrition of wild plants revisited: a re-evaluation of processes and patterns. Advances in Ecological Research 30: 1–67. Aerts, R., R. G. A. Boot, and P. J. M. Vanderaart. 1991. The relation between aboveground and belowground biomass allocation patterns and competitive ability. Oecologia 87: 551–559. and practice. Journal of Range Management 51: 625-632. Bernard, R.B. and C.A. Toft. 2007. Effect of seed size on seedling performance in a long-lived desert perennial shrub (Ericameria nauseosa: Asteraceae). International Journal of Plant Science 168: 1027-1033. Bilbrough, C. J., and M. M. Caldwell. 1997. Exploitation of springtime ephemeral N pulses by six Great Basin plant species. Ecology 78: 231–243. Bradley, B.A., and J.F. Mustard. 2006. Characterizing the landscape dynamics of an invasive plant and risk of invasion using remote sensing. Ecological Applications 16: 1132–1147. Broadhurst, L.M., A. Lowe, D.J. Coates, S.A. Cunningham, M. McDonald, P.A. Vesk and C.
Buck, J.M., R.S. Adams, J. Cone, M.T. Conkle, W.J. Libby, C.J. Eden, and M.J. Knight. 1970. California tree seed zones. San Francisco CA: USDA Forest Service. Bureau of Land Management Public Land Statistics. http://www.blm.gov/public_land_statistics/. Burton, J.B. and C.M. Burton. 2002. Diversity in the production of large quantities of native plant seed. Ecological Restoration 20: 117-123. Casper, B. B., and R. B. Jackson. 1997. Plant competition underground. Annual Review of Ecology and Systematics 28: 545–570. Clausen, J., D. Keck and W. Heisey. 1940. Experimental studies on the nature of species. I. Effect of varied environments on western North American plants. Washington DC: Carnegie Institution of Washington Publications. Cook, R.E. 1980. Germination and size-dependent mortality in Viola blanda. Oecologia 47: 115-117. Cotts, N.R., E.F. Redente and R. Schiller. 1991. Restoration methods for abandoned roads at lower elevations in Grand Teton National Park, Wyoming. Arid Soil Research and Rehabilitation 5: 235-249. Dolan, R.W. 1984. The effect of size and maternal source on individual size in a population of Ludwigia leptocarpa (Onagraceae). American Journal of Botany 71: 1302-1307. Dyer, A.R., Fenech, A., and K.J. Rice. 2000. Accelerated seedling emergence in interspecific competitive neighbourhoods. Ecology Letters 3: 523–529. Fenster, C.B. and L.F. Galloway. 2000. Inbreeding and outbreeding depression in natural populations of Chamaecrista fasciculata (Fabaceae). Conservation Biology 14: 1406-1412. Gibbs, J. and G. Young. 1989. ‘Goldar’ bluebunch wheatgrass public release documentation. U.S. Department of Agriculture, Soil Conservation Service, Boise, ID. 73 p.
Goergen, E.M., Leger, E.A., and E.K. Espeland, E.K. 2011. Native perennial grasses show evolutionary response to Bromus tectorum (Cheatgrass) invasion. PLoS One 6(3): e18145. Gross, K.L. 1984. Effects of seed size and growth form on seedling establishment of six monocarpic perennial plants. Journal of Ecology 72: 369-387. Guinon M. 1993. Promoting gene conservation through seed and plant procurement. In: T.A. Landis (Ed.). Proceedings of Western Forest Nursery Association, 1992 September 14- 18, Fallen Leaf Lake, CA. General Technical Report RM-GTR-221. Fort Collins CO: USDA Forest Service, Rocky Mountain Forest and Range Experiment Station. p. 82-100. Gustafson, D.J., D.J. Gibson and D.L. Nickrent. 2004. Competitive relationships of Andropogon gerardii (big bluestem) from remnant and restored native populations and select cultivated varieties. Functional Ecology 18: 451-457. Hendrix, S.D., E. Nielsen, T. Nielsen, and M. Schutt. 1991. Are seedlings from small seeds always inferior to seedling from large seeds? Effects of seed biomass on seedling growth in Pastinaca sativa L. New Phytologist 119: 299-305. Hendry, A.P. and M.T. Kinnison. 1999. The pace of modern life: measuring rates of contemporary microevolution. Evolution 53: 1637-1653. Hufford, K.M. and S.J. Mazer. 2003. Plant ecotypes: Genetic differentiation in the age of ecological restoration. Trends in Ecology and Evolution 18: 147-155. Humphrey, L.D. and E.W. Schupp. 2002. Seedling survival from locally and commercially obtained seeds on two semiarid sites. Restoration Ecology 10: 88-95. James, J. J., J. M. Mangold, R. L. Sheley, and T. Svejcar. 2009. Root plasticity of native and invasive Great Basin species in response to soil nitrogen heterogeneity. Plant Ecology 202: 211–220. James, J.J., M.A. Caird, R.E. Drenovsky and R.L. Sheley. 2006. Influence of resource pulses and perennial neighbors on the establishment of an invasive annual grass in the Mojave Desert. Journal of Arid Environments 67: 528-534. James, J.J., Svejcar, T.J., and M.J. Rinella. 2011. Demographic processes limiting seedling recruitment in arid grassland restoration. Journal of Applied Ecology 48: 961-969. Jones, T.A., D.C. Nielson, S.R. Larson, D.A. Johnson, T.A. Monaco, S.L. Caicco, D.G. Ogle, and S.A. Young. 2004. Registration of Fish Creek bottlebrush squirreltail germplasm. Crop Science 44: 1879-1880. Joshi, J., B. Schmidt, M.C. Caldeira, P.G. Dimitrakopoulos, J. Good, R. Harris, A. Hector, K. Huss-Danell, A. Jumpponen, A. Minns, C.P.H. Mulder, J.S. Pereira, A. Prinz, M. Scherer-Lorenzen, A.S.D. Siamantziouras, A.C. Terry, A.Y. Troumbis and J.H. Lawton. 2001. Local adaptation enhances performance of common plant species. Ecology Letters 4: 536-544. Kulmatiski, A., Beard, K.H., and J.M. Stark. 2006. Exotic plant communities shift water- use timing in a shrub-steppe ecosystem. Plant and Soil 288: 271–284. Kulpa, S.M. 2010. Identifying barriers to successful establishment of post-fire seeding in the Great Basin. Reno, NV, USA: University of Nevada, Reno. 116 p.
Leger, E.A. 2008. The adaptive value of remnant native plants in invaded communities: An example from the Great Basin. Ecological Applications 18: 1226-1235. Leger, E.A., Espeland, E.K., Merrill, K.R., and S.E. Meyer. 2009. Genetic variation and local adaptation at a cheatgrass (Bromus tectorum) invasion edge in western Nevada. Molecular Ecology 18: 4366-4379. Leimu, R. and M. Fischer. 2008. A meta-analysis of local adaptation in plants. PLoS ONE 3:1-8. Leishman, M.R. and M. Westoby. The role of seed size in seedling establishment in dry soil conditions- experimental evidence from semi-arid species. Journal of Ecology 82: 249-258. Linhart, Y.B. 1995. Restoration, revegetation, and the importance of genetic and evolutionary perspectives. In: B.A. Roundy, E.D. McArthur, J.S. Haley, and D.K. Mann [Eds]. Proceedings of Wildland Shrub and Arid Land Restoration Symposium, Oct. 19-21, 1993, Las Vegas NV. General Technical Report INT-GTR-315. Ogden UT: USDA Forest Service, Intermountain Research Station. p. 271-288. McGraw, J. B., and F. S. Chapin. 1989. Competitive ability and adaptation to fertile and infertile soils in 2 Eriophorum species. Ecology 70: 736–749. Mealor, B.A. and A.L. Hild. 2006. Potential selection in native grass populations by exotic invasion. Molecular Ecology 15: 2291-2300. Meyer, S. E. and S.B. Monsen. 1991. Habitat-correlated variation in mountain big sagebrush (Artemisia tridentata ssp. vaseyana) seed-germination patterns. Ecology 72:739-742. Nord, E.A., and J.P. Lynch. 2009. Plant phenology: a critical controller of soil resource acquisition. Journal of Experimental Botany 60: 1927–1937. of America Annual Meeting, Albuquerque NM, Aug 2-9.
of local adaptation in two native bunchgrasses. Restoration Ecology 16: 12-23.
restoration. Restoration and Management Notes 12: 40-45. Reznick, D.N. and C.K. Ghalambor. 2001. The population ecology of contemporary adaptations adaptations: what empirical studies reveal about the conditions that promote adaptive evolution. Genetica 112-113: 183-198.
roadsides at Bryce Canyon National Park, Utah. Restoration Ecology 12: 248-257. Rowe, C.L.J. 2010. Effects of seed source on seedling performance of Elymus multisetus (big squirreltail) in the Great Basin. University of Nevada, Reno. 107 pages. Rowe, C.L.J. and Leger, E.A. 2011. Competitive seedlings and inherited traits: a test of rapid evolution of Elymus multisetus (big squirreltail) in response to cheatgrass invasion. Evolutionary Applications 4: 485-498. Simons, A. M. and M. O. Johnston. 2000. Variation in seed traits of Lobelia inflate (Campanulaceae): sources and fitness consequences. American Journal of Botany 87: 124-132. Slobodkin, L.B. 1961. Growth and Regulation of Animal Populations. Holt, Rinehart and Winston, NY. Tilman, D., and D. Wedin. 1991. Plant traits and resource reduction for 5 grasses growing on a nitrogen gradient. Ecology 72: 685–700. to sagebrush communities. Pages 49-55 in N.L. Shaw, M. Pellant, and S.B. Monsen, editors. Sagegrouse habitat restoration symposium proceedings: 2001 June 4-7; Boise, ID. Proceedings RMRS-P-38. U.S. Department of Agriculture, Forest Service, Rocky Mountain Research Station, Fort Collins, Colorado, USA. Verdu, M. and A. Traveset. 2005. Early emergence enhances plant fitness: a phytogenetically controlled meta-analysis. Ecology 86: 1385-1394. Whisenant, S.G. 1990. Changing fire frequencies on Idaho's Snake River Plains: ecological and management implications. Proceedings: symposium on cheatgrass invasion, shrub dieoff and other aspects of shrub biology and management. (eds. E.D. McArthur, E.M. Romney, S.D. Smith, and P.T. Tueller) USDA General Technical Report INT-276, Ogden, UT, USA, pp. 4-10. Winn, A. A. 1988. Ecological and evolutionary consequences of seed size in Prunella vulgaris. Ecology 69: 1537-1544. Yates. 2008. Seed supply for broadscale restoration: Maximizing evolutionary potential. Evolutionary Applications 1: 587-597.